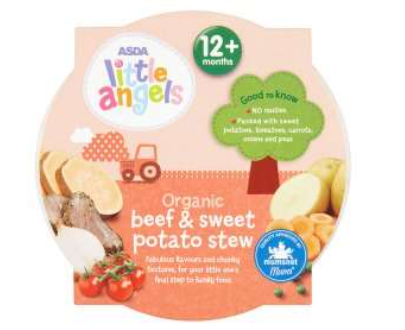 As a precaution, we are recalling ASDA Little Angels Organic Beef & Sweet Potato Stew 12m+ because a small piece of plastic has been found in one product. If you have purchased ASDA Little Angels Organic Beef & Sweet Potato Stew 12m+, please return it to your nearest store where you will be given a full refund. You do not need your receipt.